When selecting to add a task a box will appear into which you can add the name of the task. Select ‘Add Task’ to apply it to the task list. When you add the task it will be added to the list as shown here. The three buttons on the task allow you to complete the following actions. Add new sub task: Will apply a sub task to this main task. This allows you to break tasks down into multiple elements if required. 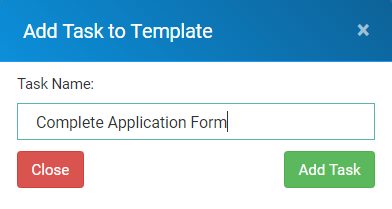 Edit task: This allows you to edit the name of the task if required. Delete task: Will remove this task from the workflow. When sub tasks have been added to the task list it will look something like this. In the next article we will cover assigning tasks to contacts.